Well hello. It’s been a while hasn’t it?! 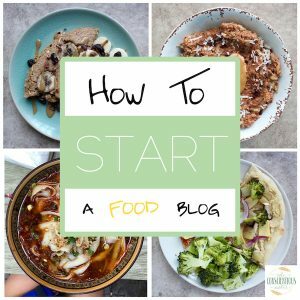 I’m not sure I remember how to write a blog post! It’s been over a month since I posted last and the break has been amazing. It wasn’t a planned break, but it was definitely needed. 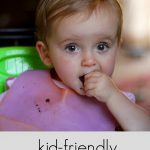 I hope to share more about what’s been going on in my life soon, but for now I’m just excited to be back sharing my first kid-friendly recipe with you all! When I first started this blog over 5 years ago, I don’t think I envisioned myself still blogging with a little girl crawling around the floor beside me. But here I am, still blogging as a mother to my sweet Harper girl. 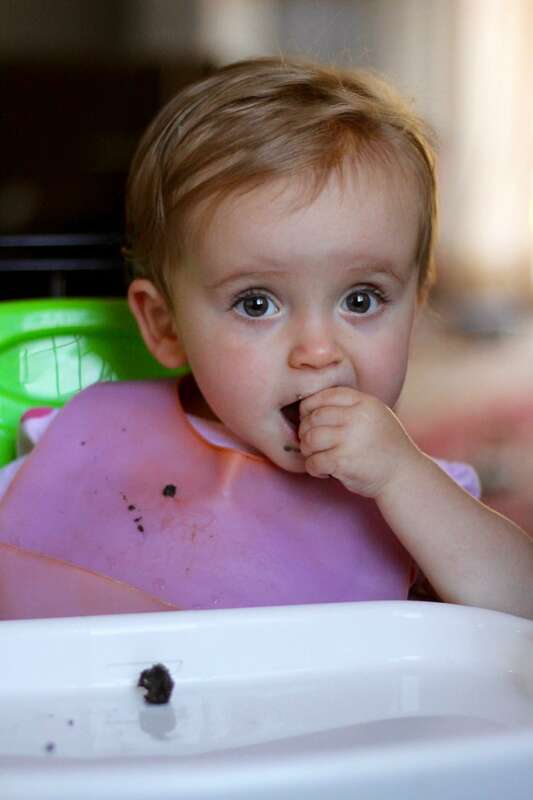 A lot of you have asked whether Harper eats a plant-based diet and the answer is: mostly! I’d say most days when we have access to a kitchen/home she eats 100% plant-based, but she has tried little bites of meat and egg here and there. The reason for this is two-fold. Firstly, the amount we travel (oh my goodness, this year has been literally nothing but travel) makes it hard sometimes to provide Harper with all the nutrients she needs from a plant-based diet. I try my best, but there are days when we’re 1.) eating out for every meal, 2.) don’t have access to a grocery store or kitchen and 3.) the plant-based, baby-friendly options aren’t adequate or she doesn’t want to eat them. So I don’t stress and just make sure she gets enough to eat from whatever whole foods are available. Secondly, I’ve really come to value Harper not fearing new foods and textures. So sometimes I’ll give her bites of whatever Brett is eating just so she can try something new. With all that said, Harper eats almost entirely plant-based and is doing well! I take her nutrition seriously though as I don’t want her to be deficient in any nutrients. Maybe I can talk more about that later, but for now I want to share with you the recipe for these Black Tahini Date Bars! Black tahini is an amazing, nutrient dense food. I discovered it when we lived in China and my tahini vender sold both white and black tahini. 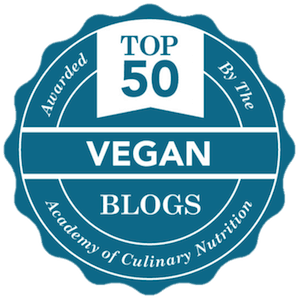 I did some research on it and found that black tahini is richer in iron and calcium than white tahini. Um, count me in! I started using black tahini it in my favorite Tahini Brownies (um chocolate + healthy benefits…yes please! 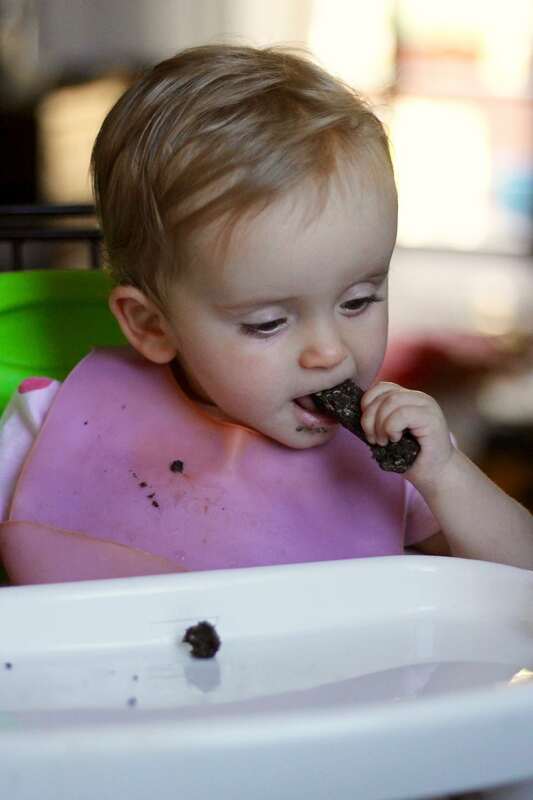 ), my Tahini Brownie Bites and am now trying to incorporate it into Harper’s diet daily. Sometimes I’ll mix it with mashed banana for a sweet puree. Sometimes I’ll stir it into her oatmeal. Lately I’ve been giving her these kid-friendly date bars and she really loves them. I had a friend and her son over the other day and her son loved them as well. Oh, and Brett and I are big fans too, so these really can be enjoyed by all! 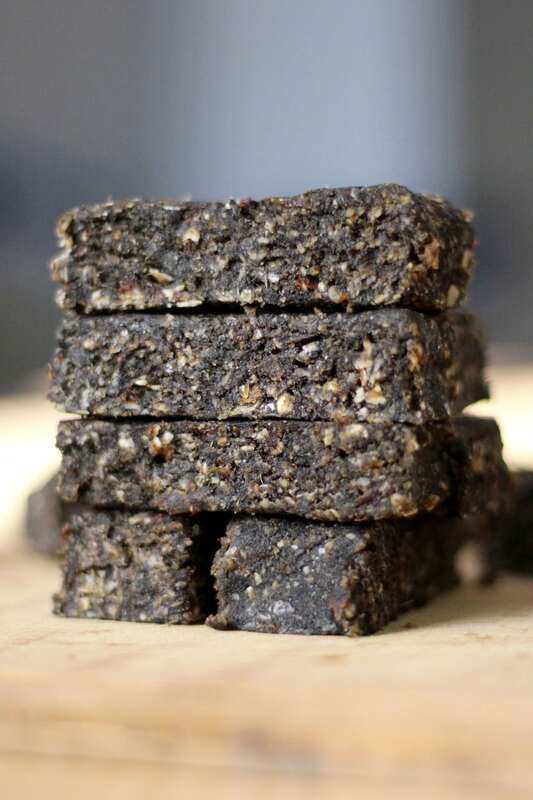 In addition to black tahini, these bars are full of fiber, whole grains and healthy fats. They’re basically a nutritional power-house and I plan to make them for Harper for years to come! 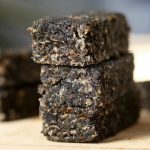 I’d love to know if you give these Black Tahini Date Bars a try and what you and your kids think! Or if you make this recipe using white tahini, please let me know how it turns out. Leave a comment down below letting me know your thoughts and please, share the recipe with others who may be interested! 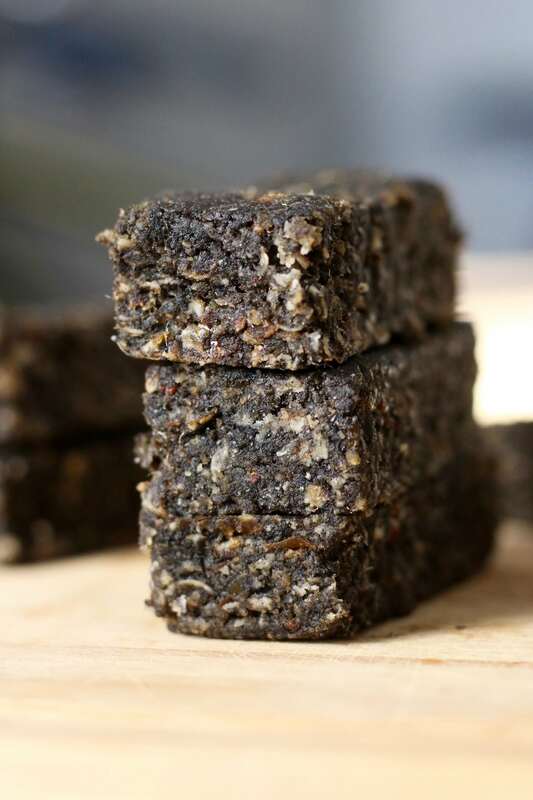 Made with whole foods and calcium-rich black tahini, these sweet and healthy Black Tahini Date Bars are both mom and kid approved! Pit your dates and place them in a bowl. Cover them with boiling water to soak for about 10 minutes. Once soft, drain the water and use a small food processor or blender to process them into a smooth paste. While the dates are soaking, whisk together the oats, ground flaxseed and almond flour. Add in the date puree and the black tahini and stir until a uniform, sticky dough forms. Chill the dough in the fridge for an hour or so before cutting into bars. I got 16 bars. Store the bars in an airtight container for 1-2 weeks! *You could also roll the dough into balls! The preparation time does not include the chilling of the dough. If you are short on time, use damp hands to roll the dough into balls. Then store the balls in an airtight container in the fridge. Thanks so much for commenting Becki! I’ve missed you all and am happy to be “back”…at least with (hopefully) a post a week or so! Let me know if you like the bars! Can you use regular Tahini instead of black? I don’t know the difference. Hi Tara! I haven’t tried it yet, but I usually use white and black interchangeably. Black just has a little more calcium and iron in it which is why I’m trying to use it in more of Harper’s meals/snacks! Every tahini is different tho and some are runnier or thicker than others, so just keep that in mind! Hi Marie! Thanks for still checking in. Sorry I’ve been MIA! I’ll share a better update soon!